Trade shows have proven to be invaluable from a business perspective because you have the opportunity to connect face-to-face with industry leaders, and perhaps the most important, potential drivers for your fleet. Huge trucking shows such as GATS can be super overwhelming and unless you have a strategic plan of how you will engage potential drivers, it’s easy to miss opportunities. 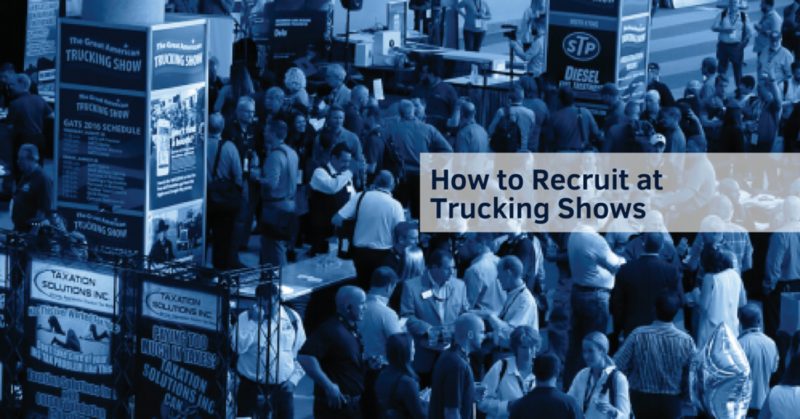 Here’s a rundown of how recruiters can optimize their time at trucking shows. You obviously want to choose to attend/exhibit at the shows where drivers are going. There are so many different ones of all sizes and you should determine which ones will have the most opportunity for your company. Looking at the show’s agenda will give you a good idea on who it’s aiming to benefit and support. Does the show you’re considering have unique programming that should attract drivers to attend? Attract drivers to your booth. Once you’re actually at the show, it’s important to have a way to get drivers to your booth. There will likely be hundreds of exhibitor booths – how will you get yours to stand out among the crowd? We have a few ideas. Pre-Show Communication – Conducting several communication touchpoints prior to the show is always a good idea. It’s not uncommon that exhibitors can gain access to an attendee list beforehand, and almost always with that list are email addresses. You can use that list to communicate that you’ll be at the show and which booth number you’ll have. Social media is also of course a great way to get the word out people who follow you with organic posts as well as people who do not yet follow you but might be interested with boosted posts. Giveaways and “Gimme” Items – a few common ways to entice people to visit exhibitor booths include running giveaways for big ticket items such as a Yeti Cooler or an Apple Watch and also giving away smaller promotional items like koozies, hats, pens, flash drives etc. These gimme items can be branded with your logo so attendees can remember where it came from. Mention these prizes in your pre-show communication so attendees know what you’re giving away and which booth number to go to. Create a differentiating factor – Whether its flashy lights or giant signage – be present, but also stand out. Engage with every person that passes by and never leave the booth unattended. Many people have questions, they just need some nudging or someone else to make a move to gauge interest. Be the exhibitor that welcomes everyone to get attendees to pause at your booth. Similar to cold calling – not every person that walks by will engage with you, but it’s worth making every effort to leave a lasting impression. Follow up after the show…send an email and then send another email. Show agendas are often hectic and time constraining; schedule appointments after the show with those people you either didn’t spend enough time with or didn’t get the chance to talk to so you can explain the value of your company to them. Use the show to get as much information as possible – lead retrieval tools such as scanners and surveys work wonders to grab mass amounts of information to utilize after the show. This also holds you accountable to not miss a single person who interacts with your booth and thus maximizes your return. Will you be at GATS? Let’s connect and schedule some time together!